Just like last year's winter issue of 'Hyaku-nin Issho', this year's has been put together in the middle of the year-end scramble to finish the set of ten prints, make a 'nengajo', and do all the exhibition preparation and interviews. The illustration you see on this page is related to the main story in this issue. It was designed by Katsushika Hokusai, and appears in a book he designed when he was about 75 years old. I borrowed it to use for my New Year greeting card this year, but I did so with some trepidation, as this type of print is very difficult to make properly. Without a complex multi-coloured design to distract the eye, it is reduced to the two basic absolutes of Japanese printmaking - the living carved line, and the expressiveness of sumi ink. Anything else would be mere decoration. When I landed in England that day, I had a small suitcase with a few clothes, my flute and a bit of music, and in my wallet about $100, enough money to last me for a few weeks until I 'got established'. My father also gave me something else, a slip of paper on which was written the telephone number of one of his friends, the drummer from the big band in which he had played many years ago, and who had been my 'godfather' when I was christened. If I got in trouble, or came to the end of my rope, this man would do what he could to help me. The next few days were a kind of dream spent wandering around the streets of that fantastic city, taking in the tourist sights and vast museums. One afternoon that first week I discovered Shaftesbury Avenue, a street lined with music shops, and it was here that I fell in love ... at first sight. She was so beautiful! She cast a spell over me in the very first moment - nestled in her velvet case, silver keys shining against her dark grenadilla wood body. Yes ... a beautiful wooden flute, an instrument about which I had dreamed for years, and she sounded as good as she looked. Checking in my wallet I found that I had just enough money left. We walked out of the shop hand-in-hand, or anyway, flute-in-bag! So of course, by the end of the week, I found that not only had I not done anything about finding work or making arrangements for flute studies, I didn't even have enough money left to make the next rent payment. I certainly wasn't going to phone my father's friend, so I had to think of something ... fast. My solution to the problem was to use my flute to make some money. That evening I stood outside the entrance to one of London's most famous concert halls, put my flute case open on the ground in front of me, and started to play. It worked well, and in one evening I made enough to pay the next week's rent. I continued this 'busking' career, working a couple of days a week, just enough to get by, right up until the weather became too cold to continue. And strangely enough, playing outside the hall led to directly to my getting a job inside! One evening as I was playing, I was surprised to see a friend I had known back in Canada a few years before. He was now working as a musician in London, and gave me the name of the conductor of an orchestra with which he sometimes worked, not one of London's large prestigious orchestras, but a smaller orchestra associated with the Imperial College. That didn't bother me, and I soon went to see this man, who asked me to 'play something' for him. To my astonishment, he then right on the spot offered me a job with his orchestra, not as a 'regular' flutist, but as soloist for one of their upcoming concerts. I want to tell you something about this little book, because it has had quite a large impact on my life; in fact if I hadn't ever seen this book, it's quite possible that I wouldn't be here today, working on this 'Hyaku-nin Isshu' print series. Some people are able to point to a particular person who has transformed the direction of their life, perhaps a teacher from school or university who inspired them to work in a certain field, but when I look back at my earlier years, I can't so easily identify any one person who stimulated my interest in something to the extent that it changed my life. Like anybody, I have been influenced and helped by many people, but such influences have, I think, mostly just been reinforcement of some particular activity in which I was already working. Actually I guess that this book would fall into the same category, as I was already interested in woodblock printmaking when I ran across it in a Kanda bookshop. It's a good thing too, for if I hadn't been, I would not have understood enough about it for it to have made any impact on me. The title is 'Fugaku Hyakkei', or 'One Hundred Views of Mount Fuji', and it was designed in the early 19th century by the famous Katsushika Hokusai. There is no text at all in the book; it consists of a series of drawings, one hundred in all, each showing a typical scene or activity of the time. In each of the pictures, totally dominating some, in others relegated to merely a bump on the horizon, can be found the familiar cone of Fuji-san. I have no idea who the customers of such a book would have been when it was originally published back in the Edo period, or why there would have been demand for such a book, but it seems to have quite good sales, as the carved blocks were used to make many editions, and even today the book can frequently be found in used bookshops specializing in such materials. I suppose people were attracted by the combination: such an illustrious theme, treated by such an illustrious designer. As beautiful as the designs are though, it is not the content of the book that makes it so important for me - my interest is in the tangible object itself, this particular assemblage of delicate paper and black ink. Many beautiful books were published in the Edo era, and some of them are astonishing creations indeed, with breathtaking designs, gorgeous colours, and delicate printing, but this book stands head and shoulders above the rest. It is the supreme peak of the Japanese woodblock printing tradition. Never before nor after was a book carved with such superlative technique, and never was a book printed in more subtle shades of the rich sumi ink. The entire book is printed only in gradations of sumi; there are no colours as we usually understand them. But those master printers could make a single stick of sumi represent a complete spectrum of colour. To hold a prime copy of this book in one's hands, to turn gently the pages one after another, drinking in the 'wholeness' of the combined mastery of the papermaker, the carver, the printer ... To do this is to understand what Japanese woodblock printing is ... and to recognize that you hold in your hand one of the most spectacular objects ever created by human beings. 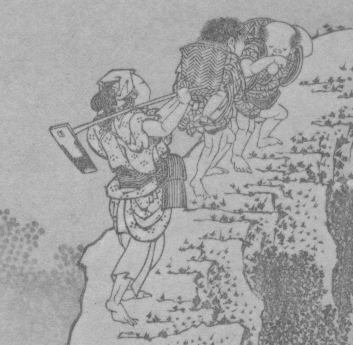 Katsushika Hokusai knew what he was doing; when he turned in his drawings to the publisher, ready for them to be carved onto cherry blocks, he specified who was to be the chief carver of the book - a man called Egawa Tomekichi. 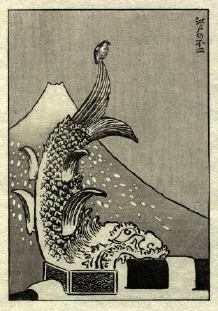 Hokusai chose him because he knew that for a book of such special designs, only the best would do. Egawa-san was the best of the best. Among the thousands of woodcarvers who have worked in this craft from that day to this, none can compare with him. It is no insult to the men still working today, as good as some of them are, to say that none can even remotely approach his skill. He will forever stand apart from all the rest of us. Every line of every kimono, every leaf of every tree, every curl of every wave, every feather of every bird ... all dance on the page in front of our eyes. 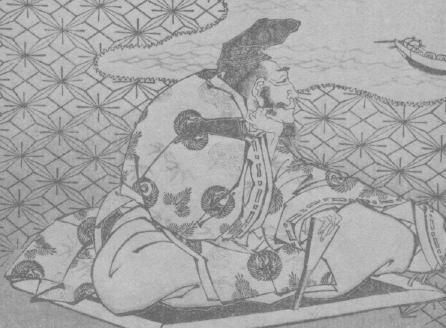 The entire world knows the name of Hokusai, how his drawn or painted figures can seem to be alive on the silk or paper ... but how many know the name of Egawa Tomekichi? Yet he was no less an artist than such a man as Hokusai. I suppose that you think I exaggerate, that I overstate my case, but you who are thinking this can never have had the experience of holding this book in your hands. And it is an early copy of the very first edition, made from the newly carved blocks by top-class printers, that you must see to understand what I am talking about. Later copies, printed from the worn-out blocks usually by printers of a lower rank, have little of this 'magic'. It was on that day fifteen years ago, in the 'Hara Shobo' bookshop in Kanda, Tokyo, that I had such an experience. The proprietor opened the glass case at my request, lifted out the small, incredibly light volume, and placed it into my hands. 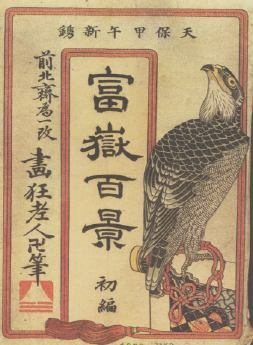 It was a perfectly printed, very early copy of Volume II (the book was issued as a set of three volumes, appearing some years apart - only the first two carved by Egawa-san). As much of a beginner at wood carving as I was then, I understood instantly what I was holding. I gently turned the pages in a daze; I knew that in a few moments I would have to return it, but how, how could I burn onto my mind's eye in those few moments the lessons that were here waiting to be learned? How could I possibly absorb in such a short time what Egawa-san could teach me? The minutes passed, the book was duly returned to its place in the case, and I passed from the shop. But what has not passed from my mind, and will never pass from my mind as long as I live, is the memory of those few minutes of contact with that man - that man whose body is long dead, but who still lives among us while copies of these books yet survive. Never, not if I live to be 99 years old, and not if I carve ten hours a day every day until that time, never will I attain such skill as his. He must have started as an apprentice at such a young age, must have worked with such a strict master, must have worked, as they all did back then, seven days a week with only festival days off, receiving as an apprentice only the smallest of payments for his work, and probably not much more even when he became his own master ... He wasn't sidetracked as I am by working as a printer, by dealing with collectors, with cooking or cleaning house, by writing essays, by writing newsletters, by playing with his computer ... He did one thing, and one thing only, but he did it better than any man had ever done before, or ever would again. I put the title 'Regrets' at the top of this little piece, and I guess I should explain why. The book I held in the shop that day was for sale. It was 1981, before the 'bubble' years, and before the world of Japanese printed books was hit with a massive inflation in values. The price was 100,000 yen. Just 100,000 yen. That the owner of that shop was willing to part with this incredible work of art in simple exchange for ten worthless pieces of coloured paper confounds me as I think about it now. Was he crazy? And what frustrates me beyond belief is that I didn't buy it. I wasn't broke, I had that much in savings set aside, and could have bought it. But I didn't. (In fairness to myself I have to admit that thinking of mundane things like food and rent instead of rare books probably was the common-sense thing to do.) And in the intervening years things have changed; even in the unlikely event that such a beautiful copy of one of these books would again become available to me, there is no way that I could ever hope to possess it. Such things are now the preserve of wealthy men or museums, men who probably don't even understand what it is that they own. Sometime later, in another bookshop somewhere, I found a modern 'offset' reproduction edition, printed delicately on fine paper, stitched together in the old-fashioned way with a needle and thread, and re-creating, as far as is possible with modern mechanical techniques, the appearance and feeling of the real volume. Of course I bought it right away, and it is this book that sits next to me on the table as I write this. Flipping through the pages, I can catch some sense of what the original feels like. 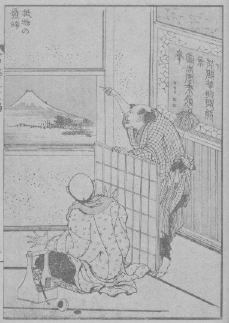 Hokusai's illustrations can be clearly seen, and Egawa-san's carved lines are there in outline, although not in essence. What is missing is the overall sensation that comes from the combination of masterfully carved blocks, fine handmade paper, and carefully blended sumi - the work of many craftsmen being fused into a complete whole by the pressure of the printer's baren. The book I hold is an imitation, a shallow substitute. But I remember the real thing ... oh how I remember! Now though, my thinking has changed dramatically. Only ten years! I find myself wishing that Fujiwara Teika had made a larger series - if only he had made 'Ni-hyaku nin Isshu' 200 prints! If that had been the case, then this ideal life could continue on and on for many more years. It think it is probable that many years from now, when I am an old man looking back at these ten years, I will realize that I was living in a kind of paradise: enjoying the support of many people, earning enough to support myself and my daughters, making beautiful prints, and most of all - enjoying a wonderfully quiet and stress-free working routine. Thank you again for your support this past year. Eighty down, twenty to go!